Publisher's note: Find even more mathemagical coloring in Visions of the Universe, new in December 2016! Contemplate the Patterns of the Universe as you color! Math is at the heart of many natural wonders and has an abstract beauty all its own—in the silhouette of a snowflake, the spiral seeds of a sunflower, and the symmetry of the Sri Yantra mandala. 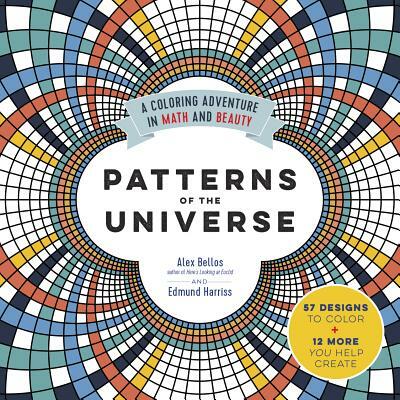 From the 4-D hypercube that casts a starlike shadow, to the infinite pattern of Penrose tiles that never perfectly repeats, these 57 exquisite designs reveal their secrets as you fill them with color. Art becomes an act of discovery—no math knowledge is required! In the bonus Creating section, as you join dots, flip coins, and follow other simple steps, 12 surprising images will emerge before your eyes. This is an adventure for all ages—and a treasure for artists in Numberland! Alex Bellos holds a degree in mathematics and philosophy from Oxford University. His bestselling books include Here’s Looking at Euclid and Can You Solve My Problems? He is the coauthor of two coloring books, Patterns of the Universe and Visions of the Universe. He writes a popular math blog and a puzzle blog for the Guardian. Illustrator Edmund Harriss is a well-known mathematical artist and a clinical assistant professor of mathematics at the University of Arkansas. He is the discoverer of the “Harriss spiral.” His research has appeared in Nature and in publications of the National Academy of Science and the American Mathematical Society. He has led many math workshops, including at the Museum of Mathematics in New York, and is the academic director of a summer camp for mathematically gifted students.